Like the other mountains in the Cascade Range, Lassen has blown its top, although not as catastrophically as Mount St. Helens in southern Washington or Mount Mazama in southern Oregon whose remnant “rain barrel” is the centerpiece of Crater Lake National Park. 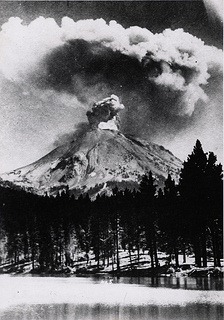 Lassen Volcanic National Park may fume and steam, but its last explosive eruption was in 1915. Today, you can visit the park without having to worry about being hit on the pate by a flying piece of hot pumice. This time-lapse video gives you a sense of how much the park changes over the course of a year as snow falls and then melts away. 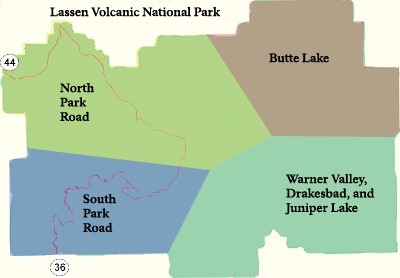 Here are itineraries suggested by the National Park Service for visits to Lassen of one day, or two or more days. Lassen Volcanic National Park has a number of campsites at Manzanita Lake as well as elsewhere in the park, and you may be able to snag one even if you drive in without having reservations. Unlike parks such as Yellowstone or the Grand Canyon, Lassen doesn’t have a grand, historic and pricey hotel. But there are two places where you can sleep indoors within the park. 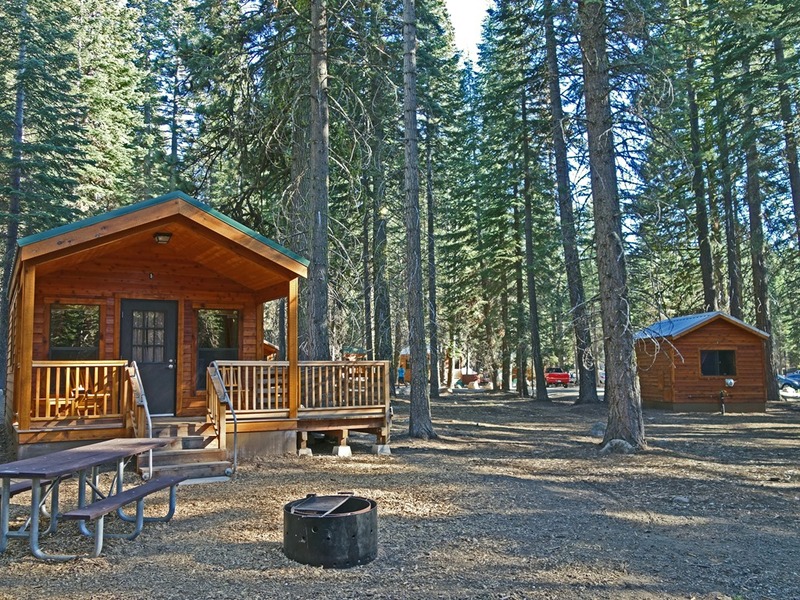 Although the lodge at Manzanita Lake on the west side of the park where I bunked back on my first visit to Lassen in 1972 is long gone, 20 basic cabins (no electricity or indoor “facilities”) opened in 2011. These cabins are extremely popular, and many are booked well in advance of the park’s late spring to early summer opening. 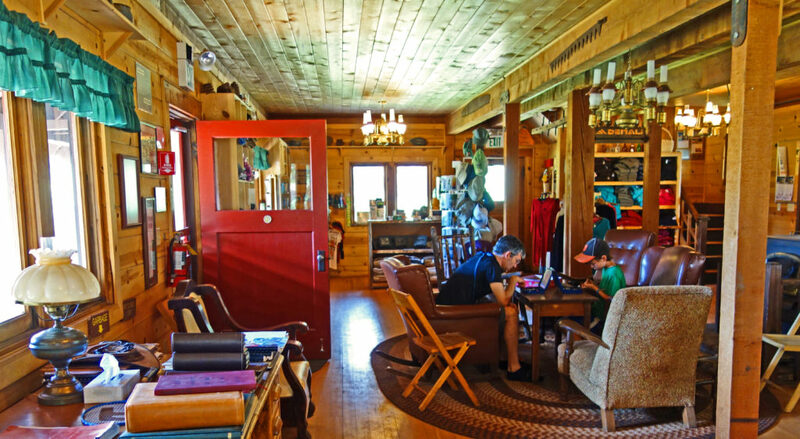 But a couple of those cabins are available without advance reservations on a first-come-first-served basis, and on certain dates for this summer and fall you may find a few available that you can reserve before your arrival in the park. 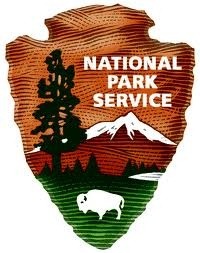 So if you have “National Park Cabin Karma,” you might not have to sleep under the stars or in a tent in that part of the park. The only full-service lodging within Lassen is at Drakesbad Guest Ranch in the southeastern section of the park. Room rates include three meals a day. Drakesbad has its share of adult guests traveling without children, but for decades it has been a family-friendly place. For each paying adult guest, one child under 12 sleeps and eats free. So a stay for two parents and two kids costs the same as it would if the parents came on their own. (Discounted rates are offered to “Young Adults” ages 13-17.) And the resort has increased its special activities for kids. In the past, getting a reservation at Drakesbad often involved divine intervention. If you didn’t phone early, you’d have to pray that you’d be lucky enough to find that there was “room at the inn” for the dates that you need it. Why? Because like many long-established small mountain resorts, two and three generations of family members would come back to stay together each and every year. Groups of friends would book for next year during this year’s stay. There were so many repeat customers that newcomers had the proverbial snowball’s chance in Bumpass Hell to get in. But, time changes things, including how families travel. Today, most families have two wage-earners whose time off from work can be difficult to coordinate. Single-parent families have to figure out who-gets-the-kids-when and where-are-you-taking-them-so-I-can-figure-out-where-to-take-them. And kids go back to school in mid-to-late August these days, not after Labor Day as was the case when I was growing up way back in the last century. What does all that mean? It means that if you contact Drakesbad now, the odds of being able to book a stay for this summer or, better yet, in September, are greater than they would have been in years past. I camped at Lassen way back in the 80s. It was beautiful. I remember being totally amazed at all the stars I could at night. Time to go back, I think. Lots of changes at Lassen since then, Cathy, including new visitor centers, no more ski area, and the new cabins at Manzanita Lake. Drakesbad is one place that probably hasn’t changed a lot except to now be easier to book and more family-friendly than ever. Very informative article–brings back wonderful memories from long ago and reminds me of why I am happy to be going back soon. Climbing a cinder cone near Butte Lake was an experience I’ll never forget–taking three steps up and sliding back one. Much less crowded than most National Parks, which is good news to those of us who prefer not fighting for a parking spot. Nice write-up on Lassen Park. 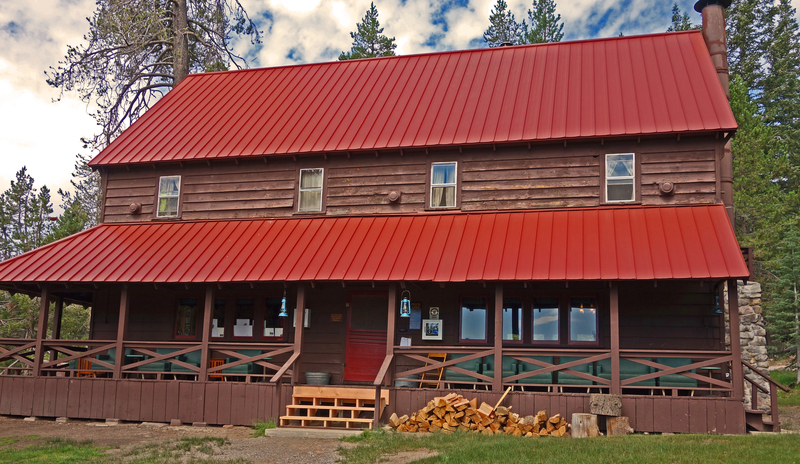 St. Bernard Lodge is only 20 minutes from the SW entrance of Lassen. Lodging and dining is available by reservation. Lassen is a great park to visit in the winter for both snowshoeing and cross-country skiing. The park rangers lead snowshoe walks in the winter. They even provide the snowwhoes for a 1.00 donation. If hiking Lassen Peak is important to you, here are the dates the Lassen Peak Trail will be open in 2014. 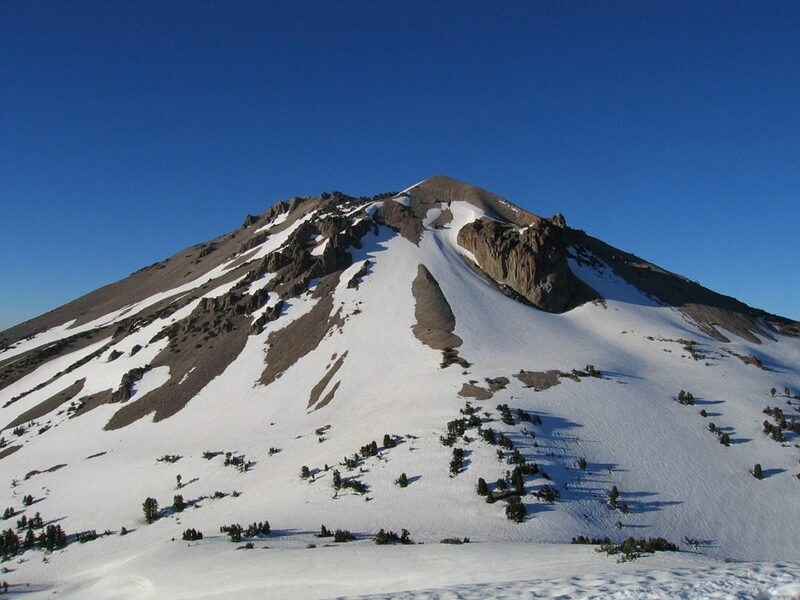 Lassen Peak trail will be open 6 weekends during 2014. Come check the progress on the Trail Restoration Project. Thanks much for sharing the dates for the peak trail openings this year. Best wishes for a great 2014 season! I worked for the concessionaire at Lassen in the summer of 1965. I was mainly at the gas station and did other odd jobs. There were cabins, a lodge, restaurant, small grocery store with a lunch counter. There were fifty or sixty college students there that summer in addition to the adult staff. On afternoon a couple came through the gas station and asked how often the volcano erupted. I responded that the next eruption would be at 4:30 and they should hurry to get a good seat (ala Old Faithful in Yellowstone). For that I was awarded a complaint and a warning not to do it again. Needless to say we all had a good time, college students being college students. Thanks for passing on your experience working at Lassen, Tom. I first visited the park in 1972 when the lodge, store, restaurant, and cabins were still at Manzanita Lake. While having dinner there one night, we overhead a woman at an adjoining table complain to her husband about the lack of a paved road (instead of a steep, rocky trail that we’d hiked during our stay) to the summit of Lassen Peak. Although I enjoyed my one-night stay in a “rustic” (new, clean, neat, but no electricity or running water) cabin at Manzanita Lake in 2013, I wish that NPS had not razed the lodge and facilities where you worked and I stayed, or eventually rebuilt it in the same style.